I’ve finally had a second attempt at the custards, and a third attempt at the comfits. Happily, this time both worked very well indeed. I’ll start with the custard first. You can find the early modern recipe and my initial attempt here. For some background on custards, see this post. Preheat the oven to 150c. Mix the flour with two beaten eggs until a dough is formed. If it’s too dry you can add a little water. Take some of the dough, about a fifth, and roll it out as thinly as you can. If you end up with holes, it’s not too much of a problem as you’ll be layering it up. Spread some of the butter on the pastry, then roll out another piece, put it on top and spread more butter. Continue until all of the pastry is layered up, don’t butter the last piece. Roll out the layered pastry again, then use to line the greased tin. Mix the sugar and rosewater with 1tbsp water, then sprinkle over the pastry case. Bake in the oven for about 10 minutes. While the pastry case is baking, whisk the remaining eggs and yolks with the cream, spices and 2 tbsp of sugar. Remove the pastry from the oven and scatter the remaining sugar and the currents over the base of the pastry case. Pour the egg and cream mixture into the case. Bake in the oven for 35-45 minutes, until the custard is set. When the custard is cool, scatter over caraway comfits (see recipe below) and stick in some dates. For the background on comfits, see this post. You will find the recipe and first attempt here. Heat the sugar with 100ml water over a low heat until the sugar is melted and the syrup is bubbling. Let it bubble for a few minutes, stirring all the time, then turn the heat right down as low as you can get it. You need to keep the mixture warm so it stays liquid, but if it’s overheating ad starting to boil you can take it off the heat for a few minutes. Once you have your warm sugar syrup ready, warm a frying pan over a very low heat and add the caraway seeds. Add a very small amount of the syrup – DO NOT add too much the comfits won’t work – see the first attempt post for an example of it going wrong! You probably want only about a tablespoon of liquid, it’s important to make sure that you only add enough to dampen the seeds slightly. Stir them round with a metal spatula until the liquid is absorbed and the seeds are dry. They look a little bit white, getting more so with each coating. When the seeds are dry, add another small amount of liquid. Repeat this process until all the liquid is done – you will need to apply many coats. Don’t be tempted to rush by adding too much liquid or by turning up the heat, or you’ll ruin them. Once they are done, cool, then store in an airtight jar. I would recommend trying both of these recipes, they both came out rather tasty. The comfits were particularly nice, you can keep them in a cupboard for a while and use them in biscuits and the like, they would also be nice sprinkled on cereal. They are quite easy to make, as long as you are careful not to use too much heat or liquid. TAke a quart of new Cream, a quarter of an ounce of Cynamon, Nutmeg quartered, and boyl it till it taste of the spice, and keep it alwayes stirring, or it will burn to; then take the yolks of 7 Eggs beaten well together with a little cold Creame; then put that into the other Creame that is on the fire, and stir it till it begin to boyle; then take it off and sweeten it with Sugar, and stir on till it be indifferent coole; then take somewhat more than a quarter of a pinte of Sack (half a pinte will be too much) sweeten that also, and set it on the fire till it be ready to boyle; then put it in a convenient vessel, and pour your Creame into it, elevating your hand to make it froath, which is the grace of your Posset; and if you put it thorow a tunnell, it is held the more exquisite way. Once again I decided to halve the recipe, since really I didn’t expect that the fiancé and I would want to drink a pint of the stuff each. In reality, even half a pint each was too much. After assembling the ingredients I heated the cream with the nutmeg and cinnamon. The largest pot of cream I could find was 600ml, which is just over 1 pint, so I kept a little of it back for the “cold cream” to beat with the egg yolks. I couldn’t find whole nutmeg though I did have cinnamon sticks, so I used one cinnamon stick and about 1 tsp of ground nutmeg. In retrospect, this was too much and the resulting posset was very cinnamonny indeed. I had large eggs, so I used 3 of them – since 7 obviously doesn’t divide easily into two. I boiled the cream with the cinnamon and nutmeg for about 4-5 minutes, stirring all the time. Then I added the egg and cream mixed together and stirred – this thickened up very quickly, you only need to do this for a minute or so. It should be the sort of thickness where if you lift some up with the ladle and drop it back down then a little crater is left in the cream that holds for a while. You are looking for the sort of thickness of a white sauce. I added 2 tbsp of caster sugar and stirred, then left it until it became “indifferent coole” – which I interpreted as “lukewarm”. I put the sherry with another tablespoon of caster sugar in a different saucepan and heated it just until bubbles started to appear around the outside – there is not a lot of sherry so you will lose some of it if you boil it too much. 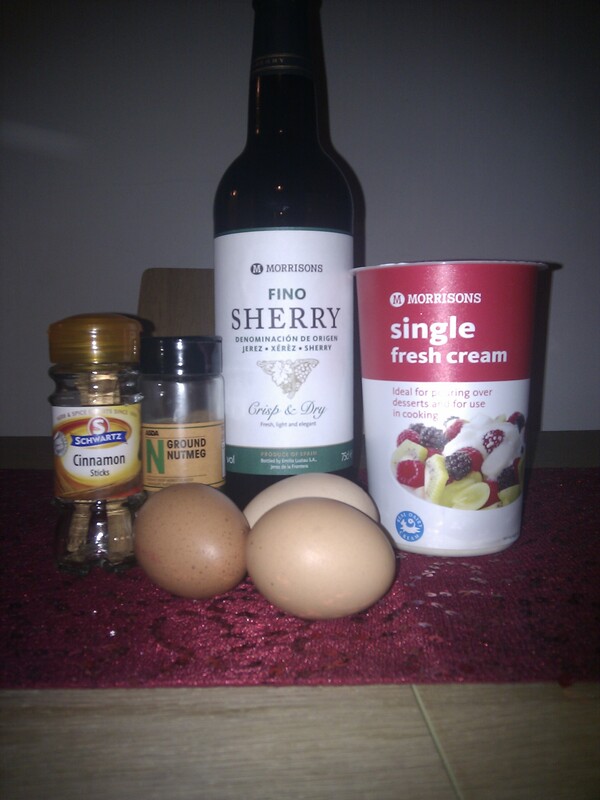 I put the sherry back in the measuring jug, then poured the cream into it. 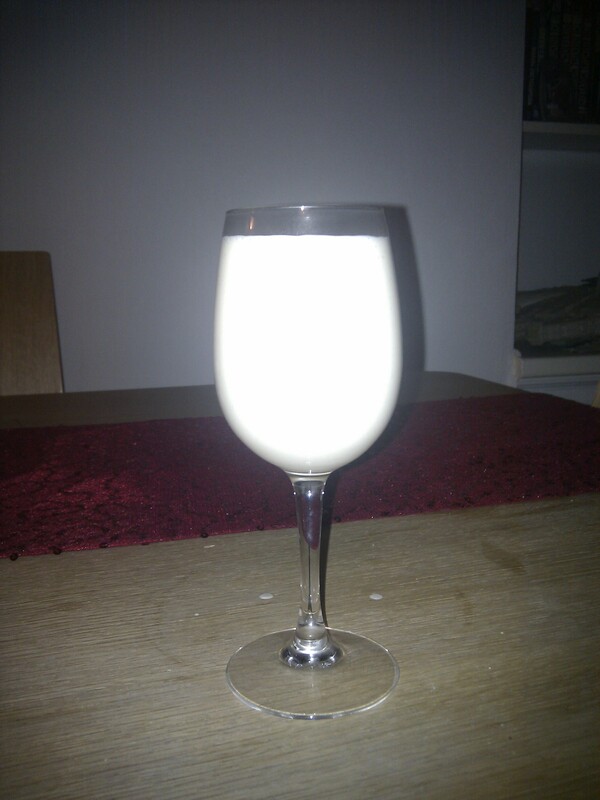 I whisked it together, “elevating” my hand then poured it into a glass to serve. I assume putting it through a tunnel means a funnel, but I don’t have one. I’m sure the effect would not be too different. It was quite tasty, and if you like eggnog and custard tarts and the like you’ll probably enjoy it. The fiancé said it tasted like “rice pudding juice”. It was very rich and I couldn’t manage a whole glass though. Not wanting it to go to waste, I froze the remainder and turned it into posset ice cream, which was probably a better way of eating it in my opinion. So, why not make some to serve as a hot wintery eggnog alternative, or freeze some to add a Renaissance twist to a dinner party? 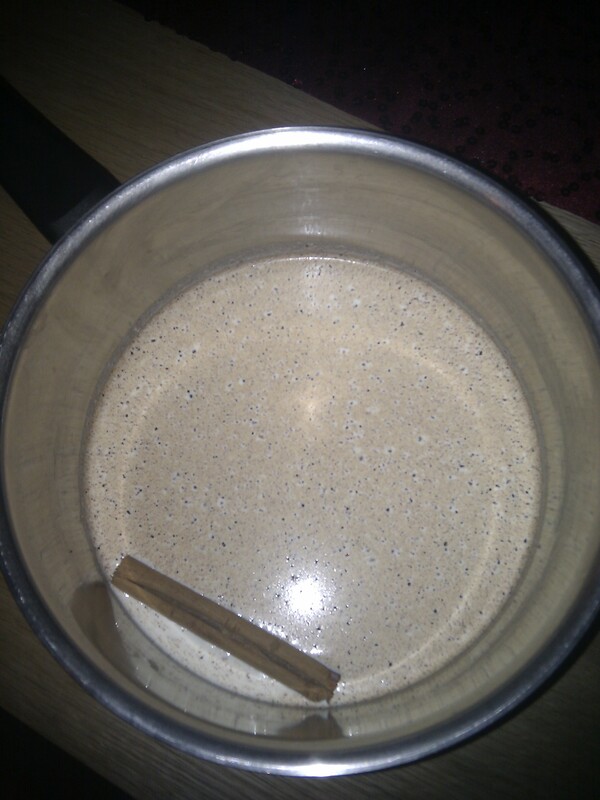 Gently heat 500ml of the cream with the cinnamon and nutmeg for 5 minutes, stirring often to make sure it doesn’t burn. Mix the remaining cream with the egg yolks, then, while the spiced cream is still on the hob, add the cream and egg yolks and stir until it boils. It will increase in volume quite a lot. Take it off the hob and then add 2 tsbp of sugar. Leave it to one side for about 10 minutes. Heat the sherry in a pan with the remaining sugar, just until it boils. 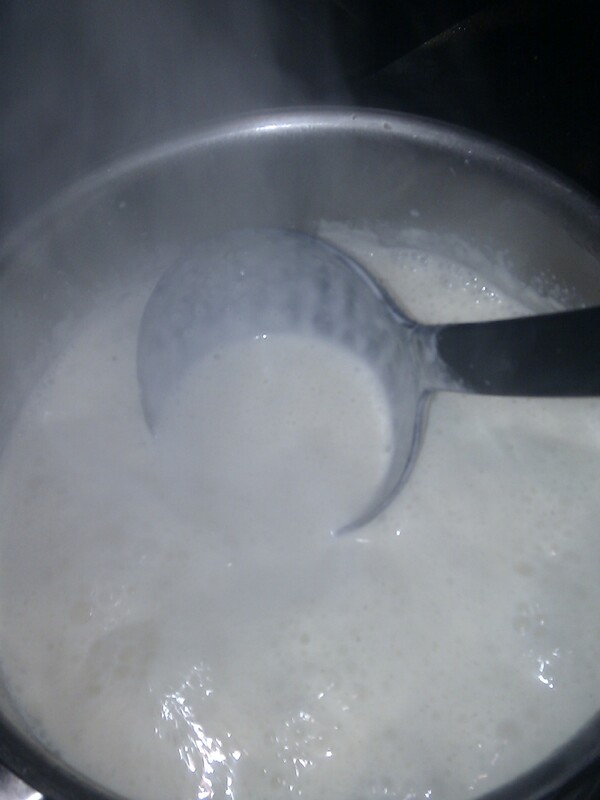 Then whisk it into the cream. Pour into individual glasses (or cool and freeze), then serve.